Yucca St. – Highland Ave. to Vine St.
4th St. – Cochran Ave. to Hoover St.
Have fun while traveling, ride a bike! If you take a look at the tabs at the top of our blog, you might notice a small change. The tab labeled “Projects Map” has been changed to just “Maps”. That is because LADOT Bike Blog is proud to launch a map showing the locations of all recently installed bicycle racks in the City of Los Angeles. Over 450 bike racks have been installed by the LADOT Bike Program since July of 2009 and we want to give you an idea of where we’ve put them. Since the LADOT Bike Program is about to go on a round of new bicycle rack installations (averaging 100 a month), this map will serve as a living document. As more racks are installed, more points will pop up on the map. Heaven forbid there are any errors, we’ll be happy to correct those too. As a heads up, google only shows 200 locations at a time. You’ll have to click through to the google maps page to peruse every location. Even though 450+ racks is a lot, that’s only a portion of the 3600+ bicycle racks and 450+ meter hitches that the LADOT Bike Program has installed throughout our City. We’re currently working on a full inventory of every rack we’ve installed, and we’ll be releasing a much more professional and exact map with every location once the inventory is completed. This map is also meant as an approximation of where bike racks are. Don’t take each push pin to mean the exact location of each rack. As stated above, we’ll have an exact map when our inventory is complete. 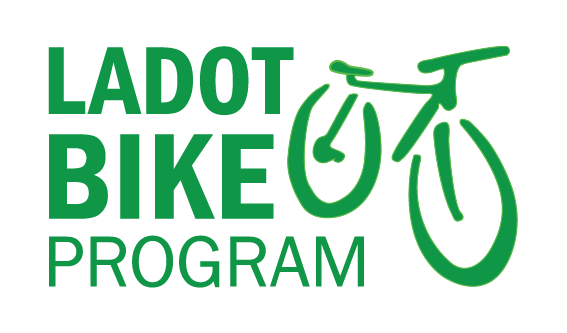 We just figured you shouldn’t have to wait for said inventory’s completion to know where the LADOT Bike Program has been working to make parking your bike easier. No Racks in Your ‘Hood? If you see that there don’t happen to be any new racks in your neck of the woods on our map: Request them! We’ve got a bit of a waiting list for new racks right now, but we’re on pace to install all of them in the next few months. If you think a business in your neighborhood should have bike racks in front of it, submit your own bike rack request. Who knows, maybe a push pin will pop up in your neighborhood on our map in the months to come!